You can pay one of the temple monks or priestesses in Ellaria, Caerfa, Bersund or Karkkila to have your character blessed. When blessed, you will lose the blessing state instead of one of your items at your next death. 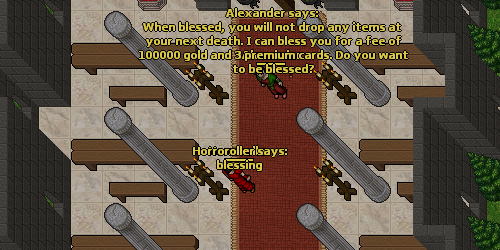 The cost of getting blessed is 100 000 gold and 3 Premium Cards. Say "blessing" to one of the temple NPCs for details.